Image – A computer-generated image of the focal point of the Treadmills development – a new civic square and performance space bordered by the converted former prison buildings and new cinema. The multi-million pounds redevelopment of Northallerton’s former prison has been given the green light. Work on transforming the site will begin next year after the scheme won approval from members of Hambleton District Council’s Planning Committee today (November 15). 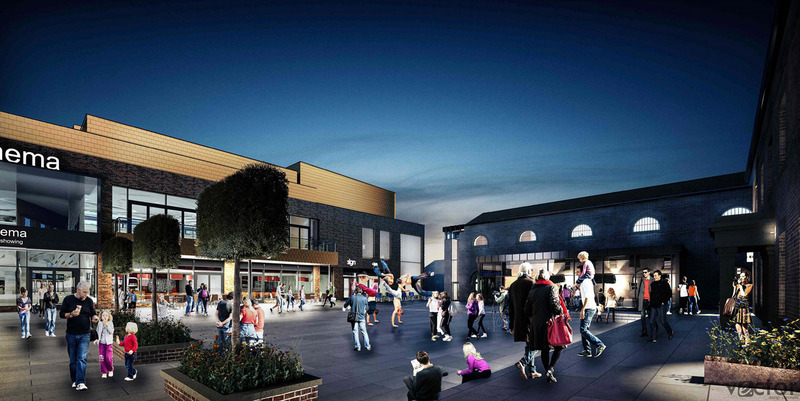 The £17m Treadmills project features retail, residential, leisure and office space as well as a large public square. It also incorporates five Grade II listed buildings which were retained when the remainder of the prison site was demolished. The project is being delivered by the Central Northallerton Development Company (CNDC), a joint venture between Hambleton District Council and developers Wykeland Group. 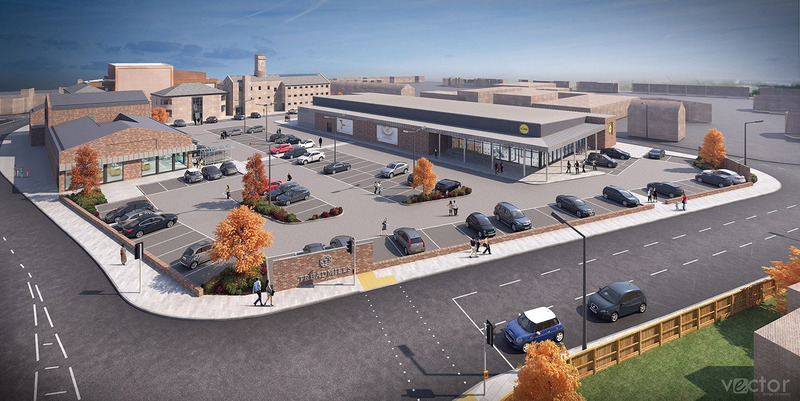 Discount supermarket Lidl has already been unveiled as the retail anchor for the project and Hull-based C4DI – the Centre for Digital Innovation – confirmed as the operator of the digital tech office space. Negotiations are underway to finalise operators of the remaining retail and leisure units. Chairman of the CNDC Board, District Councillor Peter Wilkinson, said planning approval means work on the project will start in the spring of 2019. Planning committee members were told that the scheme aims to preserve and enhance a major part of Northallerton’s history and heritage; regenerate a large brownfield site; deliver a major boost to the local economy; and bring significant new community assets and facilities to the town. Image – A computer-generated image of the Treadmills scheme, with the retail units and car parking in the foreground and the converted prison buildings to the rear. Dominic Gibbons, Managing Director of Wykeland Group, and CNDC Board Member, said: “We’re delighted this transformational redevelopment has gained planning approval and will soon move into the construction phase. Northallerton Prison housed prisoners for more than 230 years before closing in 2013. Hambleton District Council bought the site from the Ministry of Justice in 2014 securing a key strategic site close to the town centre for development. The council signed a development agreement with Wykeland Group in 2017.